Where & What Can I Recycle? Workers at the Three Rivers Solid Waste Authority Landfill in Jackson were having a typical day, accepting trucks of waste at the facility and separating the refuse with a large bulldozer. Then, suddenly, a dog jumped out of the giant pile garbage. The frightened animal ran for about 50 yards before falling over on his side. Workers rushed to the stray canine and gave him some water and food. 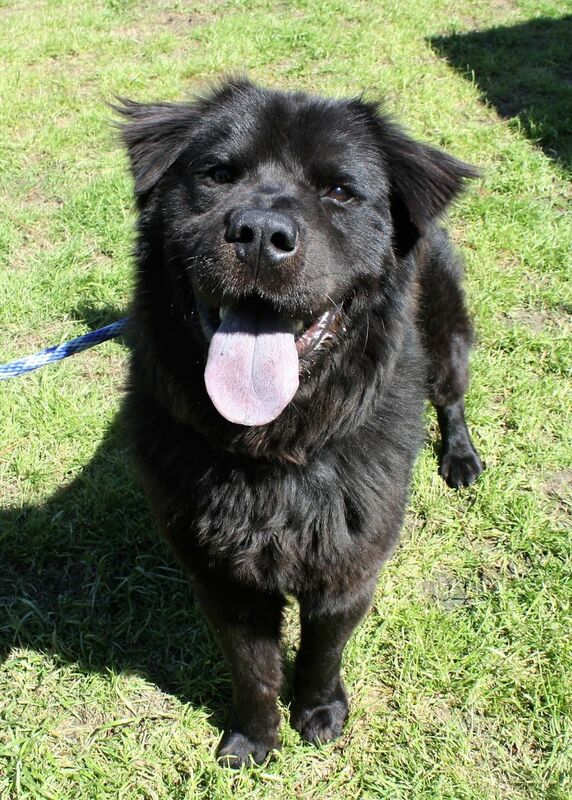 The dog – a black, fluffy, 50-pound, male Chow Chow mix – responded to the care and nourishment and snapped out of his daze. Up close, the workers could see the dog had a natural smile and was very friendly. Management called Aiken County Animal Control to pick up the stray and take him to the County Animal Shelter. A probable scenario is that the dog somehow found his way into a dump truck from another waste station, and then was buried when the truck was emptied at the landfill. After County Animal Control Officer Brandon Creel brought the dog to the Animal Shelter, the medical team there examined the stray. The team determined that he was a year old and in surprisingly good health, except for cellulitis (a bacterial infection) in his left hind leg. He arrived at the Shelter intact (unneutered) and had not been microchipped. The Animal Shelter’s staff treated the cellulitis and named the dog Roska. Shortly after Roska was neutered, he was added to the adoption floor, where Friends of the Animal Shelter volunteers could begin socializing him and getting him better prepared for the next step in his journey. With his handsome face and friendly personality, it didn’t take long for Roska to find a forever home. Now, after miraculously rising like a phoenix from landfill debris and dodging a bulldozer, Roska is safe, happy and living the good life with his new family. © Three Rivers Solid Waste Authority. All Rights Reserved • Design & Hosting provided by Mass Media Marketing. All photos on the Three Rivers Solid Waste Authority website remain the property of the photographer. Lake photo by Suzette Morganelli.